If I had a dollar for every person that asked me why their bone broth doesn’t gel, I wouldn’t necessarily be rich but… I’d have a lot more dollars. Getting your bone broth to gel has become a benchmark among foodies on the internet that you’re making bone broth correctly. 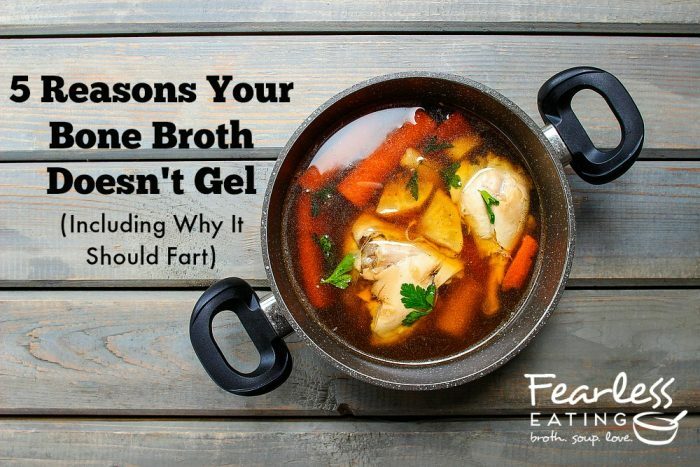 If your bone broth doesn’t gel that doesn’t mean it’s bad by any means. Sometimes you may not want a gelatin-rich bone broth. Shorter cooked broths with more meat than bones (and thus little gelatin) can be just as delicious as longer cooked, gelatin-rich broths. I discussed this in detail in my post about short-cooked flavorful broths and the difference between broths (mostly meat and short cooking times), bone stocks (more bones and longer cooking times) and bone broths (very long cooking times designed to address gut health issues). 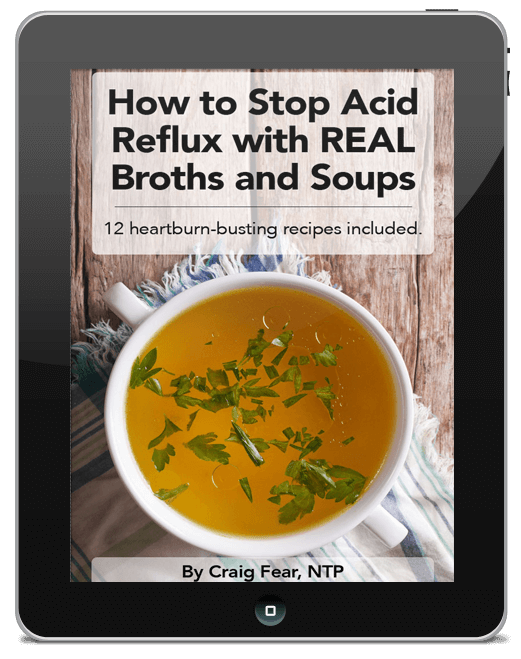 If you’re looking to address gut issues then yes, you really do want a gelatin-rich bone broth. Gelatin has properties that helps soothe intestinal inflammation, nourish the gut wall and even normalize hydrochloric acid production in the stomach (which helps to stop acid reflux). Gelatin is basically cooked collagen and collagen is highly concentrated in all the jointy parts of animals (including us). It’s the glue that keeps our joints, ligaments, tendons and skin connected, smooth, supple and lubricated. To create a gelatin-rich broth is really easy but sometimes bone broth-making newbies make some mistakes (as I did when I first started out). Which brings me to the five most common reasons why people say their bone broth doesn’t gel. Or you used too few bones. In other words, the ratio of water to bones was too high. It really could be that simple. Too much water in relation to the bones (and other parts added) will dilute the gelatin. There’s a simple eye test you can use. Fill up your stock pot about half to two-thirds with bones and then simply cover the bones with water by about one to two inches. That’s a pretty good ratio of water to bones and will insure you’re not adding too much water or using too few bones. If the water level falls below the bones during simmering you can always add more water back in. Poor quality bones from animals raised in feedlots and/or on poor quality diets will have poorer nutritional profiles. Kinda obvious, right? Many people report their bone broth doesn’t gel as well when they use conventional animal products versus those raised on pasture, in their natural environment and on their natural diet. All bones contain some collagen but you want to use bones that contain lots of it. This includes the parts that attach to bones that are also rich in gelatin. For chicken, that means a whole chicken carcass or two. You can also add in chicken feet, backs, necks and wings. For pork, traditionally, trotters (the feet) were added for this reason. For beef, the oxtail is so rich in collagen that it’s common in some cultures to just use the oxtail for the entire bone broth. Beef knuckle bones are another great source of collagen. For fish, it’s the heads. Also, to facilitate gelatin out of thicker bones, it can be helpful to chop them up and expose more of the gelatin. If you have a good knife you can easily chop smaller bones like chicken parts or even a beef oxtail. For really large bones like beef knuckle bones you might need a butcher to slice them for you. You can still throw them in whole but it will just take a long, slow, gentle simmer to release the gelatin. Speaking of a gentle simmer…. 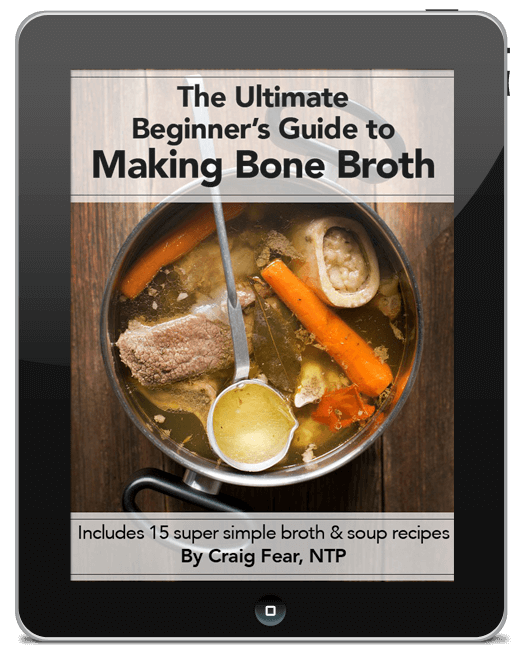 It’s often said that the key to a gelatin-rich bone broth is to let the broth smile. I think this is some weird French saying. I never really understood this analogy. I’ve never once looked at a bone broth and thought it’s smiling back at me. Have you? But I have looked at it and thought it was farting at me. If you boil your broth too aggressively for too long a period it can break the chemical bonds of the proteins that form gelatin. That doesn’t mean it’s ruined in any way. You can still consume it but it just won’t be gelatinous. To ensure the gelatin stays intact you need to gently gently simmer the broth. It’s like farting in the bathtub when you were a kid. A few bubbles rising to the surface here and there is what you’re looking for. That’s such a better analogy, isn’t it? Certainly more memorable. 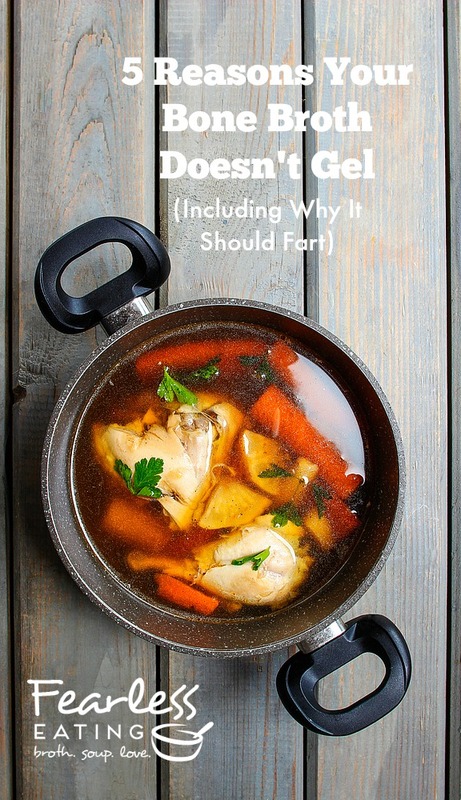 If you don’t think so, the next time you make a bone broth, be sure to declare, “Look honey, it’s farting!” and see the reaction you get. And for a good bone broth farting visual (though sadly, it’s not as cool looking as it sounds) you can check out my Youtube video for how to make chicken and beef stock here. Fast forward to around the 8:30 mark. A few farts ain’t gonna do it. You really got it let it continue farting, especially if you’re using thick, hardy bones like beef knuckle bones. The gelatin in fish heads is not trapped in hard bones and joints like land animals. Thus a short simmer time is adequate. Check out my post how to make fish stock which includes another video demo. I’ve had a few folks tell me that despite all their efforts and despite following all the common guidelines, still their bone broth doesn’t gel. There are times when I follow the list above and the broth doesn’t turn out as gelatinous as I’d hoped. Sometimes, it’s a bit of a mystery. In that case, you can cheat a little. All you have to do is mix in a little powdered gelatin and you should get a pretty nice gelatin-rich bone broth. Per quart of broth, dissolve about 2 TBSPs of powdered gelatin (this is the brand I recommend) into about 1 cup of cold water (adding it directly to the hot broth will cause clumping). Let it sit until thickened and add it to the broth and mix well. Upon cooling in the fridge the broth will become quite gelatinous.